The new British comedy, Swimming With Men, stars Rob Brydon as an accountant facing a mid-life crisis who joins an all-male group of synchronised swimmers. It hits UK cinema screens this summer on July 6th. Directed by BAFTA nominee Oliver Parker, the film stars BAFTA winner Adeel Akhtar, Downton Abbey’s Jim Carter, Sherlock’s Rupert Graves, Daniel Mays who has starred in Atonement and Line Of Duty, and This Is England’s break out star Thomas Turgoose. The idea is based on a true story about a Swedish male synchronised swimming group seen in the documentary ‘Men Who Swim’, produced by the same company behind ‘Swimming With Men’, Met Film. With some great actors in place there was just one sticking point. 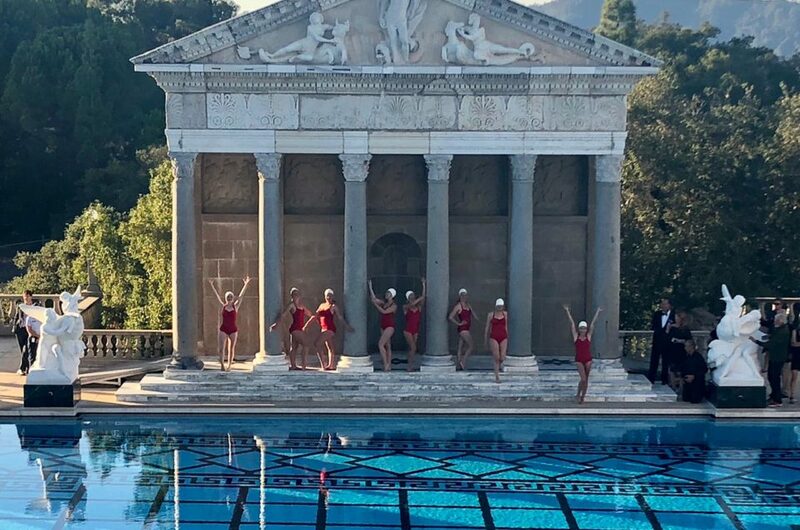 None of the actors had ever tried synchronised swimming before and all needed to learn the skills of an incredibly technical sport and choreography in just a two-week boot camp prior to filming. How was this going to be achieved? Aquabatix was consulted pre-production of Swimming With Men regarding the plan of training for the actors and brought in to assess the actors’ general swimming abilities, as well as to show them the initial basics of synchronised swimming, including sculling and the eggbeater. Each actor was given a review and areas to work on before boot camp commenced! 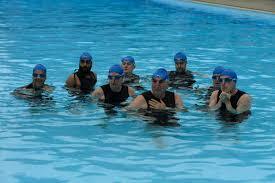 The team was rounded off by synchronised swimmers Chris Jepson and Ronan Daly, who were drafted in as extras. They assisted in the water with the actors’ learning process and ability to remember the choreography and complete the moves. Aquabatix was also consulted on the descriptions of the moves in the script, making sure they were technically correct and actual recognised moves in synchronised swimming. The coach for the Swedish team, Kata Bachry, delivered the first week of training, teaching the actors some of the original choreography seen in the documentary, which included several formations and the difficult move of a chain dolphin or, as the men came to know it, the loop – all of which is executed underwater. The actors had to be able to hold their breath for quite a while whilst linked up to the others to make the transition work, which in itself proved to be not only physically demanding but also quite the lesson on mental toughness and team trust! In week two, Aquabatix took over, drilling the actors on the moves and creating a couple of special moves just for the film. This included Thomas Turgoose learning how to back flip along with the others having to learn how to propel him high enough out the water, plus additional choreography and learning how to drill the routine on land to help save on water time and energy. 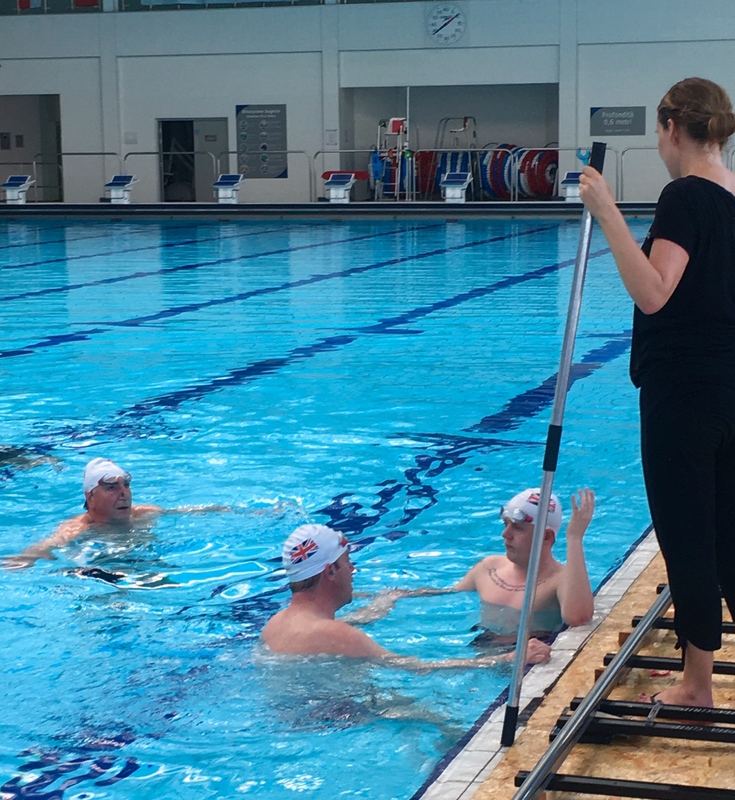 Most of the training was done with coaches Adele and Katie tapping the counts on a metal pole, which is easy for the actors to hear underwater and makes synchro swimmers naturally sharper and therefore more synchronised when first learning moves. When the actors were on the surface the coaches would also shout counts with trigger words or use an underwater microphone to talk and count for the actors over the music playing when they had their ears in the water. An underwater speaker was used so the actors could hear the sound clearly. 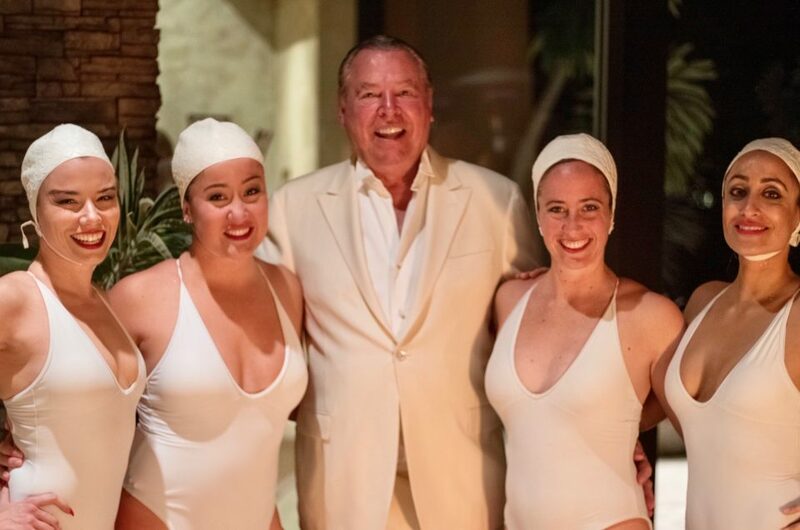 “As soon as we were introduced to Adele and Katie from Aquabatix I just knew we were in capable hands. Their professionalism, passion and humour shone through and working with them was an absolute thrill and something I’ll never forget. Above all else their patience was remarkable. The routines and shapes demanded from us actors in the water were completely alien to us but their hard work and endeavour ensured a polished performance in the final film. Not to mention an improved breath capacity!! I shall always be eternally grateful for their incredible contribution” Daniel Mays added. For the back dive to be learnt and performed safely Frankie De Celo, a former British diver, was drafted in to teach Thomas on the trampoline first, then off the side of the pool, before being able to do the manoeuvre off the team in the water. The actors spent four hours a day for ten days training and learning choreography in the pool which is no easy task! All the actors noticed a significant improvement in fitness during this short period of time. By the end of the fortnight, the group of actors had learnt the basic skills of synchronised swimming and team choreography that most would spend at least a year perfecting. 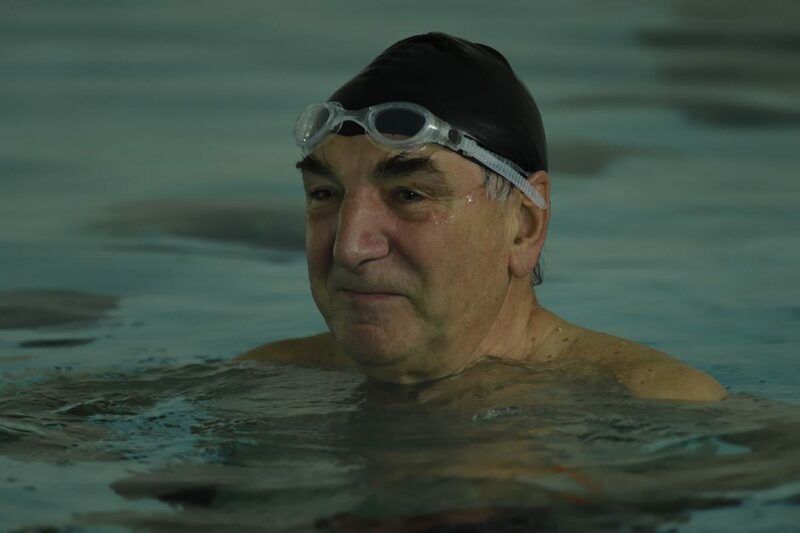 Jim Carter was surprised and commented “how they managed to make a bunch of unfit middle-aged blokes look like a synchro swimming team in just two weeks I’ll never know!” Thomas Turgoose added “A group of actors who couldn’t stay afloat managed to create a great and enjoyable film with all the help and creativeness of the girls. Without them the film wouldn’t have been made and I personally wouldn’t be able to perform the wilting flower.” It certainly helped the actors build a real rapport as a team, which comes across on screen. Aquabatix also taught actress Charlotte Riley, who plays coach Susan, the necessary synchronised swimming skills for her character’s role. Charlotte picked up the technically difficult eggbeater move instantly and was a natural with the movements she needed to learn for her part. Filming: The next four weeks were when all the pool scenes for Swimming With Men were filmed. The actors were working twelve hour days mainly in the pool as well as acting during this time. However, the real challenge came with the outdoor pool scenes. Being a British summer, the weather was cold and wet and the pool not the warmest in the world. Even with wetsuits on, the actors had to endure some quite extreme conditions as well as focus on the acting throughout. Because the water was so cold and they had to perform most of the routine in it, they were limited to only a few takes, which meant they all had to be really nailing their moves and counts each time. Adele had to make sure the actors were all prepped with counts and moves in land drill before diving in. 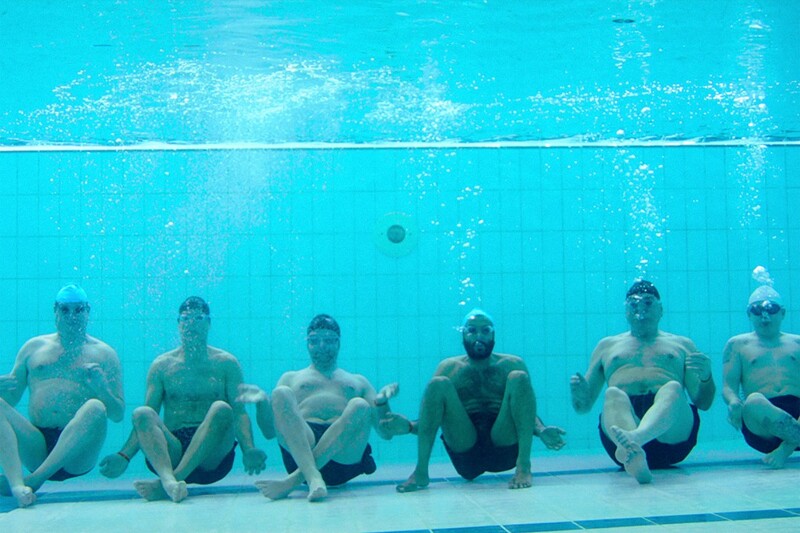 During the competition scenes, Aquabatix brought in some male synchronised swimmers to form other teams for the filming. Adele and Katie also created extra choreography for these teams, and had to teach some of the non-synchro extras the moves as well. These scenes were where the actors had to really shine, and perform the routine to the best of their ability. Rupert Graves commented: “I’ve no idea how Adele and Katie managed to get us group of middle aged wobbly men to pull off some pretty neat aquabatic manoeuvres using only kindness, imagination and great great patience, but they did. Huge respect to you both.” After four weeks of filming the actors were tired but rose to the challenge and became a team that were ready to compete!